What is a Foil Resistor? The metal foil resistor has the best precision and stability properties of all resistor types. The foil is made of an alloy of usually Nichrome with additives. It is mounted on a ceramic carrier with high heat conductivity. The foil has a thickness of only several micrometers. The desired resistance value is achieved by a photoetched resistive pattern in the foil. The metal foil resistor has a low Temperature Coefficient of Resistance (TCR), good long term stability, low noise, low capacitance, fast thermal stabilization and no inductance. The low TCR is one of the most important parameters that influence the stability. This means that the resistance value will vary only a small amount as the ambient temperature and the resistor’s internal temperature changes. Over a range from 0 till 60 deg C, a typical value for TCR is around 1 ppm per deg C. This depends on the construction (thermo-mechanical effects) and the properties of the foil material. In the planar foil the pattern is made parallel to reduce inductance (max 0.08 microH). A foil resistor is a high precision component to limit electric current. The opposition to current flow is provided by a very thin piece of metal. The excellent properties for precision and stability are due to a combination of several characteristics, which are following from the design principles of the metal foil resistor. Temperature Coefficient, Resistance (TCR) – Foil resistors achieve a low TCR by taking advantage of two characteristics of the foil. The resistance of the foil naturally increases as temperature increases. The resistor is manufactured so that rising temperature causes compression of the foil. This makes the resistance drop as temperature rises. The total effect is one of very little resistance change as temperature changes. Power Coefficient, Resistance (PCR) – PCR is a measure of how resistance changes as the resistor heats up due to current flow through it. Foil resistors have a very low PCR value. Thermal Stabilization – Thermal stabilization refers to the speed at which resistor reacts to changes in current flow and ambient temperature. The same composition and manufacturing characteristics that give foil resistors their low TCR also provide quick thermal stabilization. These resistors can have stabilization times of less than a second, as opposed to standard resistors, which may have times measured in minutes. 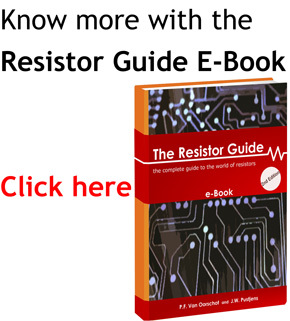 Resistive Tolerance – This parameter tells how close to the nominal value of resistance an actual resistor will be. For example, a company may sell resistors that are advertised to be 100 ohms with a tolerance of 1 percent. 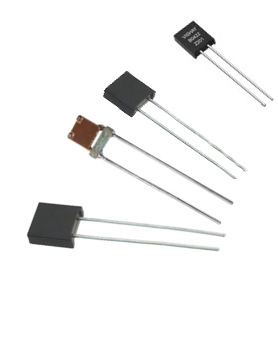 This means that the actual value of one of these resistors may range from 99 ohms to 101 ohms. Foil resistors can be made to have tolerances as low as 0.001 percent. Noise – In many circuit applications, noise generated within the circuit is to be avoided as much as possible. Audio systems are a prime example of this. The crystalline properties of the metal alloy in a foil resistor combined with special manufacturing techniques allow current to flow through these resistors with low noise generation. Voltage Coefficient, Resistance – Some resistors, particularly those of carbon composition, will display changing resistance in response to changing voltage. Foil resistors are constructed so that this effect is virtually non-existent.Thermal Electromotive Force (EMF) – When two dissimilar metals are joined, heating the connection point will cause a voltage to be induced. This induced voltage is not usually wanted in a circuit. Foil resistors reduce this EMF by using leads that are of a material that is compatible with the resistive material. The method of attaching the leads to the body of the resistor also contributes to a low induced EMF. Electrostatic Discharge – When a person touches an electrical component, the difference in potential between the person and the component can cause a discharge of electricity through the component. This electrostatic discharge can damage the component such a resistor in three ways. It may change its resistance, it may shorten its working life or it may cause it to fail completely. Because of the thickness of the foil relative to thin and thick film resistors, foil resistors are better able to withstand electrostatic discharge. Response Time and Speed – Resistors, especially wirewound resistors, can introduce inductance and capacitance in to a circuit. This can change the way the circuit responds to changes in frequency and can distort pulses as they pass through the resistor. Foil resistors are internally shaped especially to minimize this effect. Stability of Load Life – This is a measure of how well the resistor maintains a constant resistive value over time as it used under varying loads and temperatures. Due to their construction foil resistors are very stable in this respect. Foil resistors compete with several other types as high precision resistor. In a foil resistor, a special alloy is cemented to a ceramic base. A pattern is etched in to foil. This process provides the best overall characteristics available in current resistor technology. These resistors combine low inductance and capacitance, low TCR, low noise, fast thermal stabilization and minimal ESD effects in one platform. Precision Wirewound Resistors – Wirewound resistors are made by winding long strands of insulated wire around a core. The resistance is controlled by the length, diameter and alloy of the wire used. Wirewound resistors perform better than either thin or thick film resistors in stability, ESD tolerance, noise generation and TCR. However, these resistors have poor high-frequency characteristics. The coiling of the wire induces inductance, and the proximity of the coils induces capacitance. Thin Film Resistors – These resistors are made by depositing a thin layer of metal on a ceramic base. They are more economical to produce that wirewound or foil resistors. There is a value of thickness for a given alloy that is best for temperature characteristics, but the range of resistances associated with this thickness is limited. Therefore, varying thicknesses are used to produce varying resistance values. This reduces the stability and results in a higher TCR. Thin film resistors are prone to ESD damage as well. Thick Film Resistors – Thick film resistors are popular because they are low priced and can be made in very high resistances in a small size. They also have favorable frequency characteristics compared to wirewound and foil resistors. They have the drawbacks of being of lower overall precision and having the worst noise characteristics of commonly used resistor types. Audio Components – Audio components demand accurate reproduction of the signal throughout the circuitry. It must also be reproduced with no noise or distortion. Foil resistors are ideal for this application. Their crystalline structure and lead configuration provide a high signal-to-noise ratio. The design etched in to the foil also makes these resistors well-suited to use as potentiometers. They provide a smooth, linear resistance change response. Oil Rigs – Temperatures in oil rig applications can exceed 525 degrees. Where other resistor types would melt or experience major changes in value, foil resistors are able to function. The thicker layer of resistive material allows them to not only function but remain accurate for several excursions in to extreme temperature environments. Aviation – Resistors destined for use in aviation applications must be both highly precise, rugged and long-lasting. Foil resistors meet all of these requirements. With tolerances as low as 0.005%, extremely low TCR and high load life stability, these resistors are ideal for these demanding applications. Electronic Scales – Scales need to be able to maintain a high and constant level of accuracy throughout their lifetimes. Several properties of foil resistors make them suitable for this use. They have low noise, a low TCR and a low thermal EMF value. They have high load life stability with a very low tolerance. Like this page? Rate and share it!